It’s been over a decade since we’ve seen Slayers as a television series, where it ended with the defeat of Dark Star in Slayers Try . But it was only a few days ago that I even learned that a sequel was going to be broadcast this summer. And in this new television series Slayers Revolution , Lina and her merry crew seem to be as spunky as ever. Lina will probably blow her top with the very first scene, though, especially with them pointing out one of her inferiority complexes. Following tradition, the opening sequence for episode 1 of Slayers Revolution, “Amazing: The Frightening Dragon Slave! ?”, is accompanied by a song sung by Megumi Hayabashira. And the Slayers characters we’ve come to love in the previous series show up in the sequence, along with potential enemies. Although one of the enemies looks like he’s going to be too cute for his own good. As is her wont, Lina is attacking bandits. Except this time she’s attacking bandits of the sea, or in other words, pirates. Apparently her constant raiding of bandits on land has finally driven them near extinction, so for the sake of preserving the “species” on land, she’s started to raid pirates. The pirates don’t recognize her name because she introduces herself in her usual narcissistic manner. 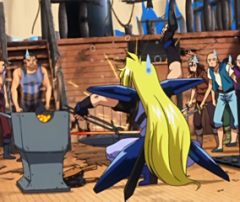 And Gourry needs to get a better sword; while his skills with the sword are as formidable as ever, his sword is just too cheap to match his level. As Lina and Gourry wreak havoc on the pirates, the pirates take out the girl mentioned earlier in the episode as hostage. Except that the “girl” is really a fishgirl. But she knows Lina’s reputation; she’s more afraid of Lina than she is of the pirates. She also helps the pirates realize who Lina really is by using the “appropriate” adjectives; the pirates didn’t recognize the “beautiful Lina”, but they’re terrified of the “destroyer Lina”. In the middle of all this, Amelia shows up with a fleet and destroys the pirate ships, although Lina gets pissed that her own little ship got destroyed in the cannon fire. The pirates flee in rowboats, but they showed a disturbing lack of survival instincts by taunting Lina’s breast size as they fled. Anyone who knows Lina Inverse would realize what would come next: they got blasted by magic. After the break, Lina and Gourry have just finished eating up a large meal. Their appetite is as humongous as ever. Amelia and Zelgadis then show up, and Lina greets them enthusiastically. Gourry, on the other hand, still needs to work on his memory, since he takes his sweet time remembering who they are. By the way, the poor mergirl that appeared as the hostage earlier in the episode almost ended up as a meal, although she manages to escape later on. The inspector of the local country, who we saw previously in the episode on the same ship as Amelia and Zelgadis were on, shows up. Amelia tries to introduce him, but he’s a narcissistic sort and introduces himself. And he prefers to be called an “inspector”, in the haughty foreign language way instead of the native language way (this is a Japanese series, so English is the foreign language). He had something to ask from Lina, which is why Amelia was helping him find her. To the surprise of everyone, what the inspector wanted from Lina was her to be arrested. But to the surprise of no one, the charge leveled against her was “Lina Inverse”: simply being Lina Inverse was the crime. Lina gets pissed off at everyone since they all found it a convincing charge. Of course, none of the usual crew expects the inspector or any reinforcements he prepared to be able to hold her, so they weren’t really worried. And it turns out that the inspector had prepared an entire battalion to make sure of her capture. Of course, this is hardly enough to contain Lina. She gets pissed off and practically defeats the soldiers single-handedly, although they don’t stay down for long. 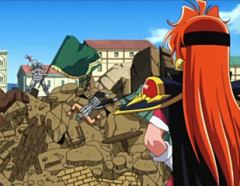 As Lina’s group runs away, large swaths of destruction sweeps through the city, and yet the group still stays free. Even the inspector’s secret weapon, a Z-1 anti-magic tank, is not enough to stop them. Anyone who knows Lina would know that it would only be a matter of time before she blew her top and cast a Dragon Slave. And indeed a Dragon Slave is cast, except that it wasn’t Lina who cast it. To the surprise of everyone, an unknown little creature, the cute little antagonist who appears in the opening sequence, is the one to cast a Dragon Slave and practically destroy the city. This ends the whole fiasco. This episode was a pretty good start to the new television series. While not the highest in animation quality, it was consistent with previous series, and it had the expected amount of slapstick and general destruction for a first episode. It’s still too early to see if it will turn out to be a great successor to the Slayers franchise, but seeing Lina and her crew back in action was great.